An arbitrated replicated volume is similar to a two-way replicated volume, in that it contains two full copies of the files in the volume. Arbitrated volumes have an extra arbiter brick for every two data bricks in the volume. Arbiter bricks do not store file data; they only store file names, structure, and metadata. Arbiter bricks use client quorum to compare metadata on the arbiter with the metadata of the other nodes to ensure consistency in the volume and prevent split-brain conditions. When an arbiter is configured, arbitration logic uses client-side quorum in auto mode to prevent file operations that would lead to split-brain conditions. Because an arbiter brick only stores file names and metadata, an arbiter brick can be much smaller than the other bricks in the volume. The node that contains the arbiter brick of one volume can be configured with the data brick of another volume. This "chaining" configuration allows you to use fewer nodes to fulfill your overall storage requirements. Red Hat Gluster Storage can convert a two-way replicated volume without arbiter bricks into an arbitrated replicated volume. See Section 5.8.5, “Converting to an arbitrated volume” for details. Arbitrated replicated volumes provide better data consistency than a two-way replicated volume that does not have arbiter bricks. However, because arbitrated replicated volumes store only metadata, they provide the same level of availability as a two-way replicated volume that does not have arbiter bricks. To achieve high-availability, you need to use a three-way replicated volume instead of an arbitrated replicated volume. Tiering is not compatible with arbitrated replicated volumes. Arbitrated volumes can only be configured in sets of three bricks at a time. Red Hat Gluster Storage can convert an existing two-way replicated volume without arbiter bricks into an arbitrated replicated volume by adding an arbiter brick to that volume. See Section 5.8.5, “Converting to an arbitrated volume” for details. This section outlines the requirements of a supported arbitrated volume deployment. The minimum system requirements for a node that contains an arbiter brick differ depending on the configuration choices made by the administrator. See Section 5.8.4, “Creating multiple arbitrated replicated volumes across fewer total nodes” for details about the differences between the dedicated arbiter and chained arbiter configurations. [a] More RAM may be necessary depending on the combined capacity of the number of arbiter bricks on the node. [b] Arbiter and data bricks can be configured on the same device provided that the data and arbiter bricks belong to different replica sets. See Section 5.8.1.2, “Arbiter capacity requirements” for further details on sizing arbiter volumes. Because an arbiter brick only stores file names and metadata, an arbiter brick can be much smaller than the other bricks in the volume or replica set. The required size for an arbiter brick depends on the number of files being stored on the volume. Alternatively, if you know how many files you will store in a volume, the recommended minimum arbiter brick size is the maximum number of files multiplied by 4 KB. For example, if you expect to have 200,000 files on your volume, your arbiter brick should be at least 800,000 KB, or 0.8 GB, in size. Red Hat also recommends overprovisioning where possible so that there is no short-term need to increase the size of the arbiter brick. In an arbitrated volume, whether a file operation is permitted depends on the current state of the bricks in the volume. The following table describes arbitration behavior in all possible volume states. All bricks available All file operations permitted. If the arbiter does not agree with the available data node, write operations fail with ENOTCONN (since the brick that is correct is not available). Other file operations are permitted. If the arbiter's metadata agrees with the available data node, all file operations are permitted. Arbiter down, data bricks available All file operations are permitted. The arbiter's records are healed when it becomes available. If the available brick is a data brick, client quorum is not met, and the volume enters an EROFS state. If the available brick is the arbiter, all file operations fail with ENOTCONN. This creates a volume with one arbiter for every three replicate bricks. The arbiter is the last brick in every set of three bricks. The syntax of this command is misleading. There are a total of 3 bricks in this set. This command creates a volume with two bricks that replicate all data and one arbiter brick that replicates only metadata. In the following example, the bricks on server3 and server6 are the arbiter bricks. Note that because multiple sets of three bricks are provided, this creates a distributed replicated volume with arbiter bricks. Chain multiple arbitrated replicated volumes together, by placing the arbiter brick for one volume on the same node as a data brick for another volume. Chaining is useful for write-heavy workloads when file size is closer to metadata file size (that is, from 32–128 KiB). This avoids all metadata I/O going through a single disk. In arbitrated distributed-replicated volumes, you can also place an arbiter brick on the same node as another replica sub-volume's data brick, since these do not share the same data. Place the arbiter bricks from multiple volumes on a single dedicated node. A dedicated arbiter node is suited to write-heavy workloads with larger files, and read-heavy workloads. The following commands create two arbitrated replicated volumes, firstvol and secondvol. Server3 contains the arbiter bricks of both volumes. 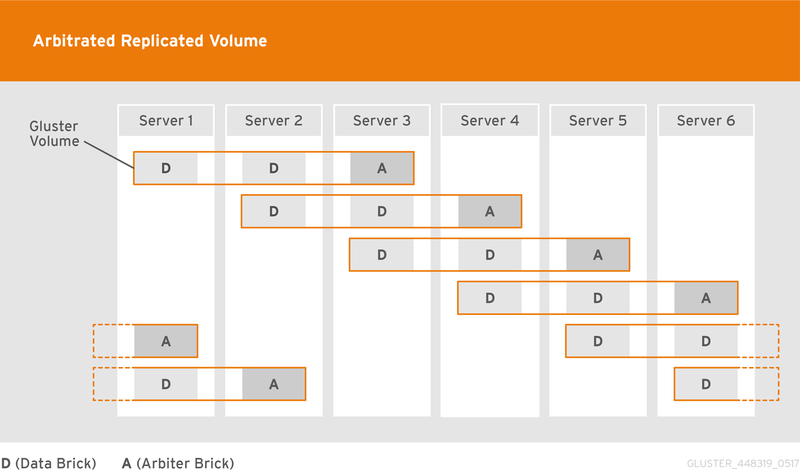 Two gluster volumes configured across five servers to create two three-way arbitrated replicated volumes, with the arbiter bricks on a dedicated arbiter node. The following command configures an arbitrated replicated volume with six sub-volumes chained across six servers in a 6 x (2 + 1) configuration. Six replicated gluster sub-volumes chained across six servers to create a 6 * (2 + 1) arbitrated distributed-replicated configuration. You can convert a replicated volume into an arbitrated volume by adding new arbiter bricks for each replicated sub-volume, or replacing replica bricks with arbiter bricks. Do not perform this process if geo-replication is configured. There is a race condition tracked by Bug 1683893 that means data can be lost when converting a volume if geo-replication is enabled. Wait until pending heal entries is 0 before proceeding. Run the following commands to disable data, metadata, and entry self-heal, and the self-heal daemon. Convert the volume by adding an arbiter brick for each replicated sub-volume. Run the following commands to re-enable self-healing on the servers. Wait until pending heal entries is 0 to ensure that all heals completed successfully. In a distributed replicated volume, data is distributed across sub-volumes, and replicated across bricks in a sub-volume. This means that to reduce the replica count of a volume, you need to remove a brick from every sub-volume. Bricks are grouped by sub-volume in the gluster volume info output. If the replica count is 3, the first 3 bricks form the first sub-volume, the next 3 bricks form the second sub-volume, and so on. In this volume, data is distributed across two sub-volumes, which each consist of three bricks. The first sub-volume consists of bricks 1, 2, and 3. The second sub-volume consists of bricks 4, 5, and 6. Removing any one brick from each subvolume using the following command reduces the replica count to 2 as required. This takes about 5 minutes. Verify that this is complete by running the following command on each client. The number of times connected=1 appears in the output is the number of bricks connected to the client. You can convert an arbitrated volume into a three-way replicated volume or a three-way distributed replicated volume by replacing the arbiter bricks with full bricks for each replicated sub-volume. Check which bricks are listed as (arbiter), and then remove those bricks from the volume. Convert the volume by adding a brick for each replicated sub-volume. For dedicated arbiter nodes, use JBOD for arbiter bricks, and RAID6 for data bricks. For chained arbiter volumes, use the same RAID6 drive for both data and arbiter bricks. See Chapter 21, Tuning for Performance for more information on enhancing performance that is not specific to the use of arbiter volumes.